After the fact edit: I just realized that I repeatedly mention cardboard squares in this review, and the main playing pieces are, in fact, circles. Man, am I embarrassed. Especially because there's a picture, right there, with a picture of cardboard circles. Imagine my discomposure. I recently obtained a copy of a game called Fealty. It is not, as you may have supposed, a game where you have to work for other people in exchange for pretty much nothing at all. Instead, it is a game where you put down cardboard squares and then, when you're finished with that part, put down some other cardboard squares. At the end, you count how many cardboard squares you put down, and if you put down the most, then you win the game. At this point, the other people at the table now have to work for you for free. Except they left that last part out - that's my personal house rule. In many ways, Fealty is very similar to Neuroshima Hex, except that it is played with squares, so it's probably more accurate to call it Neuroshima Square. Except that it also does not have a theme about robots and mutants and nuclear fallout, because it has a theme about knights and barons and nobles and stuff instead. And you don't shoot anyone, either, you just get in their way so they can't do their jobs. In that way, the game is a little like working for the government. Now, just putting down squares would be boring, so each square does something different, and you can't wait to see what other people are going to put down, because you have to choose a card that you play before you put down your square. And the card will tell you who goes first and who will probably beat up the guy who goes first, except that Fealty is a non-violent game that does not endorse beating up guys at all. Like I said, instead of beatings, you just bother people. So once you choose your card and see what card everyone else has chosen (you all do this part at the same time), you put down the square that matches your card. Maybe your square is called a knight, and he will let you put down some smaller squares at the end of the game, as long as nobody else blocks him with their own squares so that he is unable to reach the squares where he wanted to put down smaller squares. Or maybe your chosen square is an agent, who is very fast and good at capturing cities, but who gets a lot of wedgies from knights (knights are bullies. Everyone knows that). And then you can put down your agent, and he will let you move one of your other squares, like the one who is the important nobleman who doesn't do very much at all. This is especially handy if a square you previously placed on the board is now blocked by either an opposing player's square or, in the worst case, that lady from HR who never returns your phone calls but who is absolutely not going to let you have a poster of Megan Fox because she is way too hot, even if she is wearing a tent. You have to be very careful as you put down your squares, and you have to think very far ahead. In this way Fealty is once again a lot like Neuroshima Hex, because all the pieces you put down will interact with other pieces and set off square piece chain reactions that will eventually destroy the economies of small square countries. Planning is important, but if you're not good at planning, it won't matter because other people's squares will completely ruin all your plans anyway. Once you have all had several turns to put down different kinds of squares, you will put out some other tiny squares that will let you know all the places where imaginary people will be forced to work for you in exchange for pretty much nothing. Putting down these little squares is how you win, so you want to put down a lot of them, but if you didn't plan very well (possibly because you got a headache after five minutes and quit trying to plan), then you will not get to put down very many small colored squares, and you will lose. And if you're at my table, then you have to wash my dishes. In the tradition of ancient codes of fealty, I will let you keep a soap bubble. 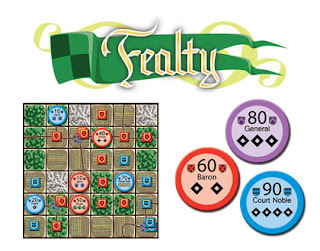 It is important that I note that I did not enjoy playing Fealty very much. I am sure there are people who will find this game intriguing and involved. I am not one of those people. If you took a jigsaw puzzle, started doing the puzzle, and then every five minutes, someone came up and moved all the pieces and added pieces from a different puzzle, you would know how I felt playing Fealty. It's like a puzzle where the solution changes every two minutes. It's not very fun to me. It's more aggravating. Plus if I have knights and barons and woodsmen and stuff, I want to stab someone. I do not want to just get in their way and make loud noises so they forget what they were saying. However, as much as I did not like playing Fealty, I know that other people will like it. Some people like doing very confusing puzzles. Other people will just like that your squares never do any punching. I actually read a few places where people thought Fealty was a gem, but they were obviously wrong, because Fealty is a cardboard box full of cardboard squares, and none of those would make very good jewelry. However, if you play a game where you have to work for someone to get a giant bucket of nothing, maybe someone will let you make rings and necklaces from their copy of the game. It will be not be very nice jewelry. You might be surprised how often I hear that. Oh now, I just feel trite.